Locate a notary by entering your desired zip code. Our locator search is quick and easy to access. Input your zip code to swiftly find a notary public in your area! 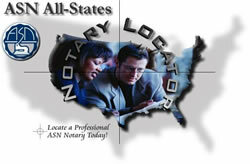 ASN checks notary commission status upon initial listing in our Locator and at membership renewal. Commission status is subject to change; contact the notary's commissioning authority for current commission status.